I was sorting through some old papers the other day and I found the credit report from when I originally applied for the mortgage to buy my home. My Credit scores from 4/21/99: Experian 724, Transunion 725, Equifax 777 My credit history had dated back to Sept. 1989. I had a single 30 day delinquency showing on my credit the time of the report. Experian and Transunion showed a 30 day delinquency but not the Equifax didn't which explained the 50 point discrepancy. I don't know what the delinquency was from and I couldn't see anything in the report that really explained that or looked like a delinquency. This all reminded me that I should get my free credit report Quizzle. I have recommended that you should spread out your free credit reports. And I had a free credit score and report due from Quizzle in June. I went ahead and got the report from Quizzle. Why did I score 776? You have at least 4 open accounts on your credit history. You are wisely using your credit cards, and have kept the average amount of debt on your cards below 15 percent of the card limit. You have a long credit history. Your credit file shows you have established a credit history of at least 20 years of financial transactions. You paid all your accounts on time last month. You paid all your installment and auto loan accounts on time in the recent past." "Could your credit use a little tweaking? 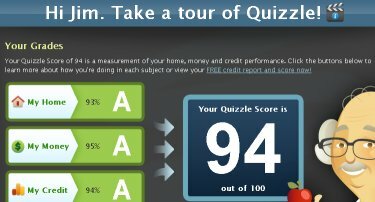 "It looks like your potential for improvement is 0 points, but it's still good to practice smart credit management. ..."
OK so that is saying that my score can go up 0 points. I have 'no negative factors' and my score can go up '0 points'. It seems that given my situation my score is as high as I can get it right now. Dispute inaccuracies on your credit report. Pay all your bills on time every month. If you have past-due bills, pay up and stay current. Pay down your credit cards." But this still leaves me wondering what I could be doing 'better' to have a higher score. As far as I know I'm not doing anything "wrong". So how do people get scores in the 800-850 range? I found an old discussion on Fatwallet where people are talking what >800 scores takes. Many of the people in that thread with >800 scores are similar situations as mine. I'm not sure but its possible my score is still recovering from the 30 day delinquency I had in the past. But I'd assume not since that item is over 10 years old. Maybe my mortgage is dragging down my score some? I don't know. I was trying to figure this all out and then I remembered that I recently got a credit card at Sears when we bought our new dishwasher. That card application was a 'hard inquiry' on my credit and would have dropped my score by "a few" points or "about 5 points" according to a couple sources. Also that new Sears card is a new card with a short history so it might be pulling down my average some. So I'm guessing getting that new Sears card pretty recently probably dropped my score some. But this is still pretty much just guess work. Unfortunately the credit scores are black boxes and nobody knows for sure what goes on inside their formulas. I don't really need to worry about my score though. I don't really have any need to get my score higher. A score of 776 is pretty high. On the MyFICO site they list loan rates for various score ranges. The scores and the rates they expect you'd get are shown to the right. You can see the top score range is 760 to 850 and I'm in that range. So it seems I should be able to qualify for the best interest rates on a mortgage.